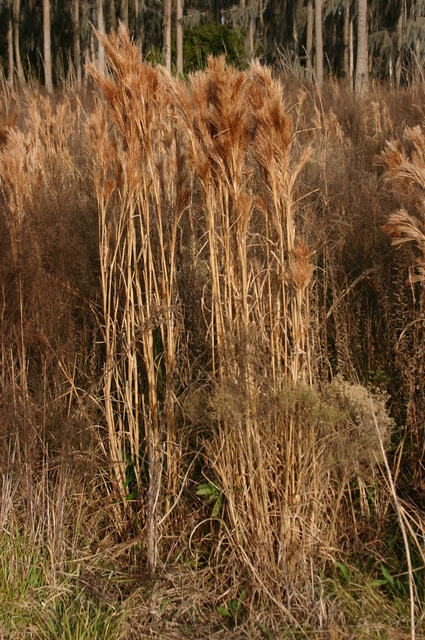 Andropogon glomeratus.© Les Mehrhoff, 2008-2010.discoverlife.org (Accessed 10/2015). Andropogon glomeratus is a perennial C4 grass (Wand et al. 1999), stems in clumps, much like A. virginicus but inflorescence compressed at top of stem in a broom-like tuft; old plants persistent. Winter color orange-tan; blooms and fruits Aug.-Oct.
Habitat: Wet or moist soil, pH 5-6.3, open swamp edges. Wet meadows. Tolerant of anaerobic soils, intolerant of drought, shade, salt (USDA, NRCS 2006). Notes: Seeds eaten by songbirds (USFWS 2005).